Legislation that imposes tough new restrictions on traveling sales crews has been signed into law by the Governor. 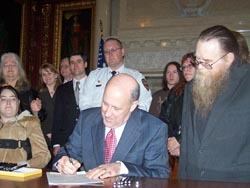 Governor Jim Doyle says the bill, known as Malinda&apos;s Act, regulates an industry that&apos;s gone unchecked for far too long. The measure signed Thursday afternoon requires companies employing traveling sales crews to pay semi-monthly wages and prevents them from seizing cell phones or ID cards from the workers. It also requires companies to register with the state, conduct criminal background checks, and make sure vehicles used to transport sales crew meet safety standards. The legislation is named for Malinda Turvey, one of seven members of a traveling sales crew who were killed in a van crash near Janesville ten years ago. Doyle says the crash shed light on an unchecked and abusive industry. He says it&apos;s unfortunate that it took a decade to pass the measure. Malinda&apos;s father, Phil Ellenbecker, thanked the governor and lawmakers who continued the fight to pass the legislation. Companies who use traveling sales crews have raised concerns that it will make it harder for them to do business in Wisconsin. If they treat their employees fairly, Doyle says they have nothing to worry about.